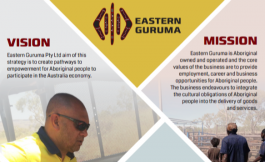 Originated with the vision of creating pathways to empowerment for Aboriginal people in Australia, Eastern Guruma Pty Ltd is 100% owned by members of the traditional owner group, Eastern Guruma. Initially contracting the civil and mining industries, this vision has echoed throughout our operations over the years. It has been this prophecy, and the determination of our team carrying it through, that has allowed us to expand tenfold.